And since i had windows 7 i wanted to make dual boot so i clicked on Something Else. Now this brings the other page which lets you create and delete partitions as well as shrinking existing partitions. Be careful though ubuntu drive partitioning differs from windows. I could not get it at first time but then i understood. 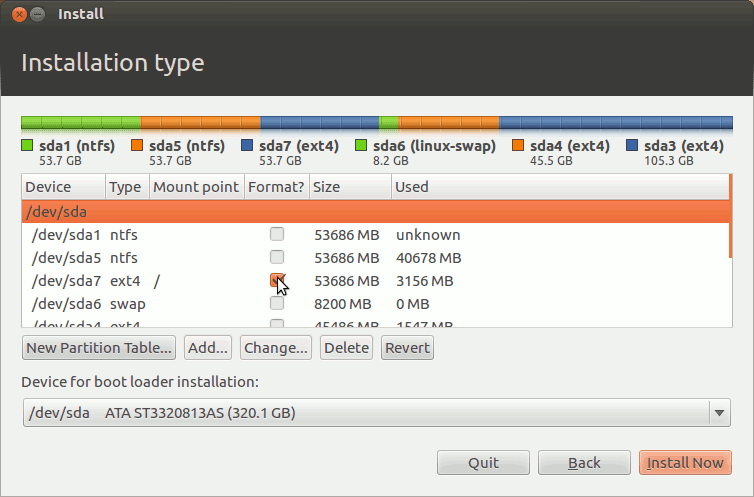 As we can see ubuntu separates drives with letters a b and partitions with numbers 1 2. And when we select a partition on the bottom we can see the name of the manufacturer of the drive we have. That way we can see which drive is selected. We must be careful when making partitions and deleting. We delete partition that we know it has no data's on it and we create it again and do fresh format. As i said this is not a text about ubuntu installation rather im trying to get into a point where i must warm you before doing a mistake. The screen above lets you create partitions, shrink partitions and perform ubuntu installation. Notice that ubuntu asks you to define mount point. And in the dropdown you have different options. For example / is the root of drive /boot is the partition where you want boot informations to be and the option that this text is dedicated to is the /swap option. This can cost you. 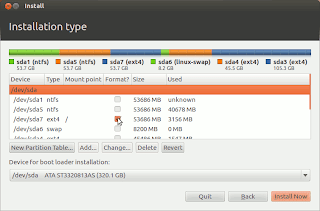 Ubuntu uses swap space if it runs out of memory or disk space. I haven't seen any improvements on performance and other things by using swap space but i decided to make a perfect installation as it requires. Be careful when using swap space because if by mistake you select a drive that has data on it to use it as a swap space you will erase everything on that drive just by one click. Because ubuntu converts that drive to different file system that windows and other operating system dont read. For example on windows we have NTFS and FAT and on ubuntu we have Ext2 Ext3 Ext4 and others. However you can still save your data if you follow some careful steps the ubuntu community explains. But still the percentage is very very low for you to get back 100% of data's you lost. So be careful read the instructions on ubuntu installation, and very very important dont be lazy and make sure you back up your data before installing any operating system. As for ubuntu be careful when using swap space. Create new partition around 1GB for swap space is enough. And make sure in that partition you dont have data. However i haven't seen any improvements by using swap space so dont mess with it. I warmed you Do Not Mess With SWAP SPACE !!! i lost my data and i know what kind of headache is so i dont want others to suffer too.